The Gutor PXP with its PFC rectifier (Power Factor Correction) will drastically reduce the THDi (harmonics at the input) to a very low level. Therefore, it is the right choice for applications where less distortion to upstream networks is important. With its robust design, it also fits the requirements for harsh environments as faced in Oil & Gas and other heavy industries. The possibility to order PXP transformerless will reduce the already very small footprint further. Platform with large installation base and many years of proven field reliability. Decentralized control architecture for increased reliability. Redundant and individually monitored fans. 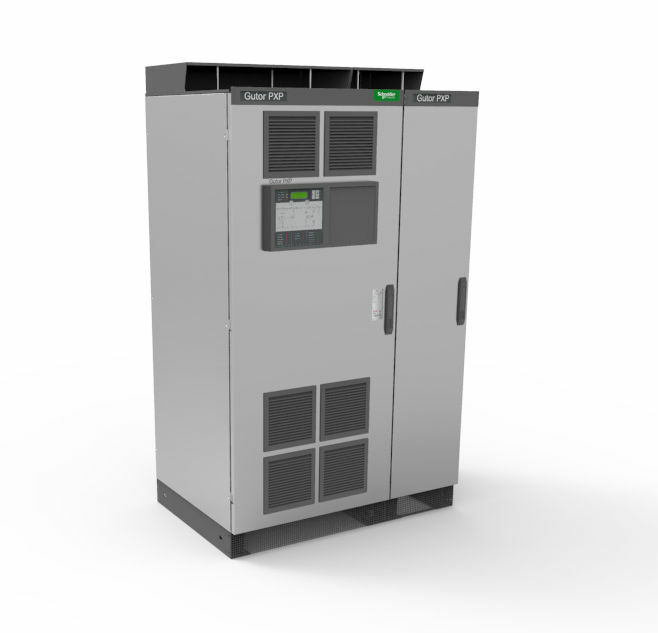 Smallest footprint on the market among industrial UPS systems. Ideal for applications with limited available space. PFC rectifier dramatically reduces input harmonics (< 5 %THDi), minimizing distortion to upstream equipment. Optional transformerless configuration available. Further reduction in footprint, weight, and cost while increasing efficiency and having equivalent performance.